we are a Chinese left-wing news group focusing on workers' movement in China mainland and have something emergent to inform you. More than 30 workers and students, including labor union initiators with their family members and supporters have been detained since July 27th, and we send you now the report about their struggle. Could you please release it on your medias and encourage your friends to disseminate this news? Thanks in advance! On May 10, 2018, several employee representatives went to the District’s ‘official’ Worker Union with a joint letter for Jiashi workers, complaining about the company’s illegal management and hoping that they could organize their own labor union in the company. The vice chairman of the District Federation of Trade Unions declared that the labor union could be organized by themselves. On June 7, 2018, these employees submitted an application for organizing a union to the District Federation and to its subsidiary Street Unions. The officials instructed that the representatives can first recruit members by themselves. Under the direction of the District Unions, the representatives prepared an “Questionnaire of Willingness to Join Jiashi Trade Union”, and as many as 89 employees signed to join. However, on July 12, 2018, vice chairman of the District Federation, and other four union officials, together with Jiashi deputy general manager and department managers blamed the representative Mi Jiuping. The vice chairman of District Federation had approved the application one month before, suddenly turned hostile and said it is illegal for Jiashi workers to establish a union. On July 16, Liu Penghua, another employee representative was deliberately transferred to a different workplace for no reason. There he was immediately beaten by two unidentified men, who later drove out of the factory without any obstruction! 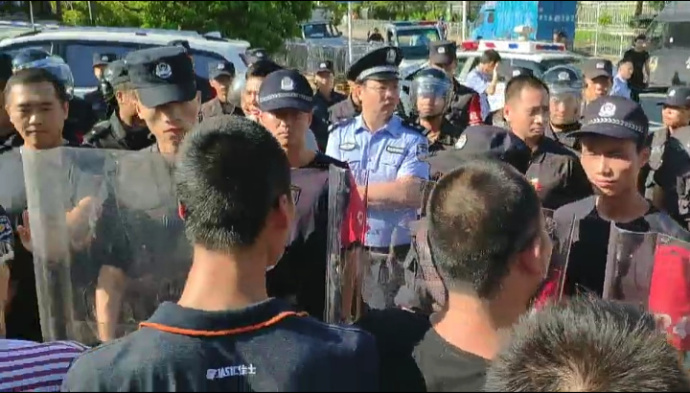 Workers called the police who ignored Liu Penghua's injury and instead asked him to negotiate with the factory by himself! Liu Penghua was detained by the police station until 12 o'clock p.m that day, with his fellow workers standing at the door of police station and supporting him. By August 13, 2018, they are still detained which has drawn attention of the whole country. People from all around have written open letters to Yanziling Police Station’s superior department, Shenzhen City Government, requiring to release them immediately and to investigate illegal conducts of Jiashi Company and local police station seriously. We are appealing for international solidarity so that the local authority would set them free as soon as possible and that foreign friends who care for workers’ cause in China could know more about it: Chinese workers with increasing class consciousness will never end their fighting!